Granby firefighter Josh Fleischer, from left, Colorado State Forest Service District Forester Ron Cousineau, Grand Fire Protection District No. 1 Public Information Officer Schelly Olson, Winter Park Highlands Homeowners Association president Bill Tetlow, Mike Braddy of the WPHHA and Granby interim fire chief Jim Cautrell pose with the sign designating the Winter Park Highlands as a Firewise community on Wednesday, Aug. 29. 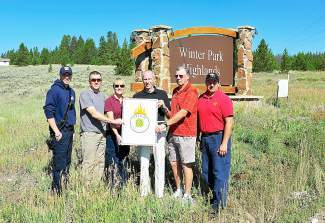 Winter Park Highlands has gone through a fire prevention overhaul, transforming itself from the most hazardous to one of the most proactive communities in Grand County. On Wednesday, Aug. 28, the subdivision officially received recognition as a National Fire Protection Association Firewise Community. The program, sponsored by the U.S. Forest Service, U.S. Department of Interior and National Association of State Foresters, teaches communities to take action in preventing losses from wildfire. The Highlands joins Pole Creek Meadows as one of only two communities in Grand County to receive the recognition. The Winter Park Highlands community had their work cut out for them. Three state Community Wildfire Protection Plans, completed in 2006, 2007 and 2009, rated the Highlands as an “extreme” fire hazard. Homes within the community are located on or near steep slopes. Few residents had defensible space cleared around their homes. Substantial stands of beetle-killed pines created heavy loads which could fuel and spread crown fires. Home addresses were poorly marked. Long, winding roads both made access difficult for emergency responders and complicated escape for residents. The community started by adding a fire pond at Elk Park, completed in the mid-2000s. They’re currently working on constructing an underground water tank for firefighters’ use, and hope to add two more in the future. “The pond had an immediate effect on lowering insurance rates for people here in the Highlands and in surrounding communities,” Tetlow said. After the pond construction, the HOA board began working to create fire breaks on green space and to bring grant programs to homeowners so they could address dead trees and fire fuel reduction on the properties. Tetlow figures he removed around 500 trees from his own 3-acre lot. All that tree removal can place a heavy financial burden on homeowners. Current and past board members on the HOA worked to educate homeowners on grants and tax incentive programs that helped them cut tree removal costs. They also worked to get grants from the U.S. Bureau of Land Management to assist with installing the underground water tank. Tetlow worked to bring HOA members and other homeowners in the community reflective, fireproof address signs that help responders identify homes during fires and other emergencies. The community’s final challenge was creating routes which provide quick escape during dangerous situations. For Tetlow, it takes a 4.3 mile drive to get from his own lot to Highway 40. “The advantage is, we’ve got great views living up here. The disadvantage is getting out if there’s a fire,” he said. The HOA board worked with adjoining property owners to provide escape egresses to Granby Ranch or on private roads leading to Highway 40. Remarkably, past and present board members completed all their fire prevention work with a HOA that has entirely voluntary membership. Annual dues are only $100. The voluntary nature of the HOA has presented some barriers to the community’s wildfire protection plans. According to Tetlow, about a third of the community’s 420 lots are vacant. He said his greatest challenge has been getting some of these lot owners to respond and complete hazardous tree mitigation on their properties. “It’s an ongoing thing, but at least our efforts are being recognized,” he said.